ADMHO Recruitment 2019: Apply Offline For ADMHO Medical Officer Recruitment Notification 2019. Addl. 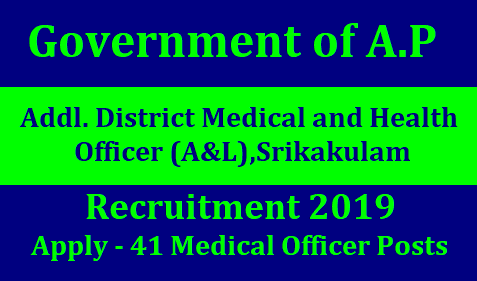 District Medical and Health Officer (A&L),Srikakulam has Published Recruitment Notification 2019 For the Posts of Medical Officer of 41 Vacancies. ADMHO Organization wants to fill the 41 Posts of Medical Officer. Job Seekers who are waiting for ADMHO Announcement can use this Wonderful opportunity. Contenders who are eligible can Apply Offline on its Official website srikakulam.ap.gov.in directly. The complete information about thus ADMHO Medical Officer Recruitment 2019 is updated here in this page clearly. So we hope that Candidates are feeling happy with our work. Remaining Details of ADMHO Medical Officer Jobs like Educational Qualification, Age Limit, Pay Scale, Selection Process, Application Fee, How to Apply ADMHO Recruitment, and Important Links, Important dates, Required certificates all are Mentioned below. Interested and eligible candidates can download in the prescribed form from website srikakulam.ap.gov.in and send their application form on or before 21.01.2019. The Prescribed format along with the photocopy of all relevant documents should be submitted to the address mentioned below.